What to do about the Truth and Reconciliation Commission's Call to Action? Many of you will be aware of the Truth and Reconciliation Committee hearings, a component of the Indian Residential Schools Settlement Agreement, which occurred across Canada over 5 years. In May, 2015 the committee issued a summary report and 99 recommendations for taking action to right the wrongs against Aboriginal people. The Sisters of St Ann, were involved in four Residential Schools in BC spanning a period of over 100 years. 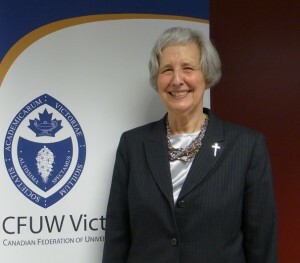 Sister Marie Zarowny, with the support of the Sisters of St. Ann, has been personally involved for 20 years in bringing about justice, healing and reconciliation for First Peoples in relation to their Residential Schools experiences. In 2008 the Sisters of St. Ann established a Graduate Nursing Scholarship for nurse practitioners and an undergraduate bursary, both with preference given to students intending to work in rural communities. Sister Marie Zarowny will present steps leading up to the Residential School settlement and the formation of the Truth and Reconciliation Committee, will touch on the healing journey of the Aboriginal Peoples, and will talk about the Truth and Reconciliation Committee's Call to Action. You won't want to miss this evening on February 17 to share the insights of this amazing woman!